For your child’s health is specially formulated for pregnant women, nursing mothers, infants and children with a unique probiotic and prebiotic blend containing Bifidobacterium infantis and Bifidobacterium bifidum – the dominant and most important beneficial cultures of friendly bacteria found in healthy infants and children. Pregnant and breastfeeding women can take OptiBacProbiotics For your child’s health during their pregnancy and nursing periods to maintain healthy levels of the appropriate types of beneficial bacteria for child health. In the cases of vaginal birth, a newborn swallows what will become its first healthy intestinal microflora as it passes through the mother’s birth canal. This is nature’s way for mothers to inoculate their babies and provide them with a foundation of healthy bacteria for their future health. At the time of birth, if the mother has good levels of friendly bacteria, and the right types to support child health, these will be passed to the baby during birth! 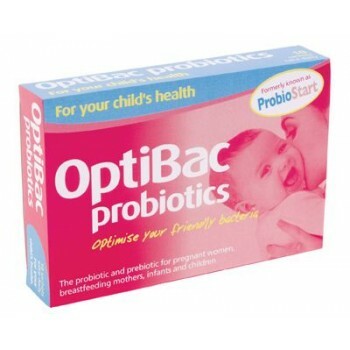 Many pregnant women take this OptiBac Probiotics formula during pregnancy for this purpose. Following birth, development of the infant’s microflora is influenced by diet (breast milk / formula), environment, and medication (e.g. antibiotics). The natural development of bifidobacteria in infants is favoured by breast-feeding, and studies have found higher concentrations of Bifidobacterium infantis and Bifidobacterium bifidum in breast-fed infants as opposed to babies bottle-fed with formulas. Many nursing mothers take For your child’s health while breastfeeding to help support their child’s levels of friendly bacteria during this time. From 6 months onwards, introducing OptiBac Probiotics For your child’s health into your child’s diet supports the development of friendly probiotic bacteria promoting good digestive health and supporting natural immune defences. Medical research shows that a good balance of friendly bacteria helps support digestion, immunity and energy levels for all infants and children, in particular: a) formula fed infants, b) infants delivered by caesarean section, c) preterm (premature) infants (Caesarean babies and pre-term babies unfortunately do not receive the full benefits of healthy bacteria from the mother), d) infants and children with allergies and skin irritations such as eczema, e) infants and children with digestive problems such as colic, diarrhoea, constipation and lactose intolerance, and f) infants and young children during and after antibiotic therapy. The overuse or misuse of antibiotics in infants and children may result in unhealthy intestinal conditions as antibiotics deplete normal levels of intestinal bacteria. Unbalanced levels of bacteria can manifest in the form of allergies and digestive problems in children whereas healthy levels can contribute to their overall health and wellbeing. A healthy balance of friendly bacteria in the intestines provides specific enzymes needed in the digestion of particular substances, production of B complex vitamins and vitamin K, and improves the absorption and uptake of minerals and nutrients in the diet, including calcium which is important during the early years of growth. Introducing For your child’s health into your child’s diet supports the development of friendly probiotic bacteria promoting good digestive health and supporting natural immune defences. During infancy & childhood the types of friendly bacteria that naturally live in our intestines are very different from the types found in adulthood and old age. Bifidobacterium infantis and Bifidobacterium bifidum are the dominant and most important beneficial cultures found in healthy infants and children during their early years and have unique benefits in supporting digestion, immunity and resistance to infection. The prebiotics in For your child’s health help maintain high levels of bifidobacteria by acting as a food source for the probiotics to flourish in the intestines. Bifidobacterium infantis Rosell-33 (1 billion). Bifidobacterium bifidum Rosell-71 (1 billion). Lactobacillus acidophilus Rosell-52 (1 billion). 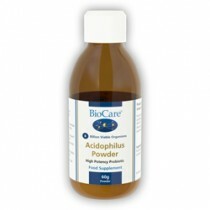 Formula also includes Prebiotic fibres known as fructooligosaccharides 300mg. OptiBac Probiotics guarantees 3 billion live micro-organisms per sachet until the best before date. Infants 6 to 12 months: one sachet per day or as professionally directed. Children 12 months and above: one-to-two sachets per day as needed or as professionally directed. Pregnant and nursing mothers: one sachet per day or as professionally directed. This OptiBac Probiotics formula can be easily mixed with your child’s favourite cold foods or beverages - avoid hot foods or fluids (can be taken with formula milk when it is at room temperature, but not when heated as heat reduces the viability of the beneficial bacteria). It is not recommended to give probiotics to severely immunosuppressed patients, post cardiac surgery patients, patients with pancreatitis, patients in the Intensive Care Unit (ICU) or patients with blood in the stool unless under a doctor’s care.